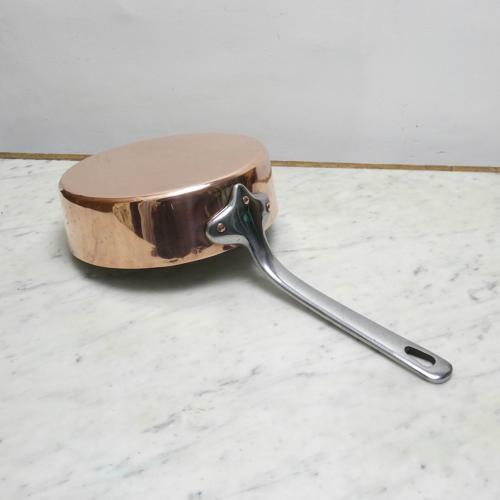 A large, and very good quality, French copper, deep saute pan. This pan is stamped, to the side, with the number '26'. This relates to the internal diameter of the pan in centimetres. It dates from c.1880. It has a nicely shaped steel handle, which was only used by a few quality French manufactures, and it is made from a very heavy gauge of copper. It is in excellent condition, and the interior has been re-tinned, so that it can be used. The pan measures 26.6cm. diameter by 8.2cm. deep. The other sizes quoted are the overall dimensions.